In accordance with the latest Warsaw Barometer, the record percentage of residents of our nation’s capital (as much as 89%) assesses functioning of public transport as good or very good. Such opinion is influenced first of all by the conviction of Warsaw residents about constant improvement in the quality of public transport in the city. On the occasion of the World Car Free Day, the Public Transport Authority (ZTM) and Mobilis, the biggest private carrier in the capital jointly promote bus transport and present its effectiveness. The Warsaw Traffic Survey conducted in 2015 showed that on average 1.3 persons travel by one car on Warsaw streets. 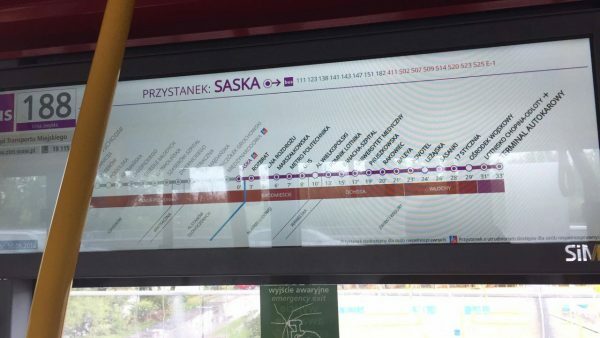 Two buses (9-meter and 18-meter long) can accommodate as many people as more than 140 cars that usually travel across Warsaw. Traveling by public transport is also a choice that is obviously more environmentally friendly. One car with an average number of 1.3 passengers emits about 140 g/km of carbon dioxide, whereas a new bus with diesel engine, which carries on average 80 people, emits 0.006 g/km of carbon monoxide per person. ZTM and representatives of Mobilis illustrated effectiveness and ecological aspect of public transport with an experiment involving a hundred drivers, who at the Połczyńska P +R left their cars and moved to two buses from the new Mobilis fleet. "Experiences of many cities show that promotion of public transport contributes to reduction of traffic jams much better than construction of new roads or bridges. This idea is also implemented in Warsaw" – said Katarzyna Strzegowska, ZTM Deputy Director in Warsaw. "An important part of the system of balanced and intelligent public transport is Park and Ride facilities. They are located primarily in the proximity of main transport hubs – at subway and railway stations. Drivers can drive to such parking lot, leave their car and continue their travel by public transport. In such a way, we can have a visible impact on reduction in the number of vehicles driving to downtown areas" – says Katarzyna Strzegowska. Warsaw residents traveling by buses have become accustomed to increasing comfort of travel, which increases thanks to investments in the new fleet. Vehicles traveling on Warsaw streets are more advanced and have an increasing number of conveniences for passengers. 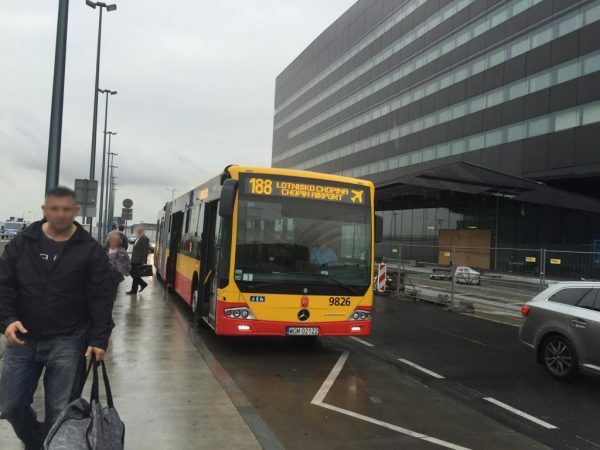 The average age of buses that carry passengers in Warsaw was reduced from 10.8 years (2006) to 6.66 years (2015). In the end of July 2016, Warsaw streets welcomed a hundred of factory new, practically zero emission buses of Mobilis, the biggest independent public transport operator in the capital. "On the occasion of the World Car Free Day, we want to jointly show that buses in the city are much more effective and environmentally friendly means of transport than passenger cars. Travel by bus is cheaper, safer and faster for passengers, and also allows to generate significant savings for the city calculated based on cost/benefit analysis, i.e. 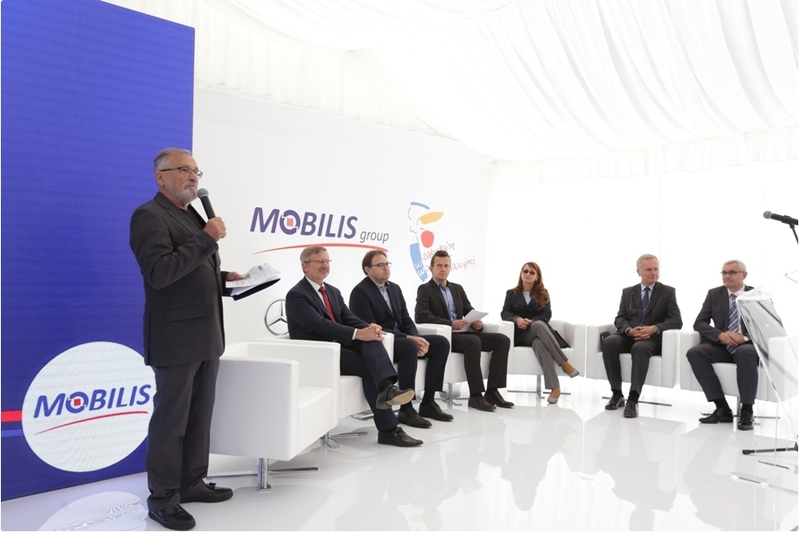 taking into consideration all cost drivers, starting from time spent in traffic jams, to costs related to environmental pollution – said Dariusz Załuska, General Manager of Mobilis Sp. z o.o. "We are delighted that along with the new fleet we can offer to passengers very high comfort of travel. Buses from our latest fleet have a number of upgrades, including air conditioning, monitoring, ticket machines, LCD displays with passenger information, stop announcement system, and inscriptions in Braille alphabet. As we know, human aspect has always been an important part of providing transport service; therefore, we spare no efforts on making sure that our drivers are comprehensively trained, including in the scope of customer service" – says Dariusz Załuska. Equipment in Warsaw buses has changed over the years. Since 2013, all vehicles have been accessible to wheelchair users and passengers carrying children in strollers. The first low-floor buses appeared on Warsaw streets in 1994. Today, it is a standard, which can be confirmed by the new Mercedes Conecto G.
"We are happy that Warsaw residents and visitors can travel by modern, comfortable and above all safe buses. Mercedes-Benz buses are an optimal solution for passengers, including those with limited mobility, drivers and operator. In addition, these vehicles have an innovative recuperative module, which significantly reduces fuel consumption and thus emissions and environmental burden" – highlights Antonio Cavotta, General Manager of EvoBus Polska. The key role is also played by efficient monitoring system, which considerably improves the level of safety in vehicles. This condition is met already by three quarters of buses (72.14%) traveling on Warsaw streets. "In Solaris Alpino vehicles, monitoring system comprises as many as 7 cameras, which record image from both passenger space and driver’s cab. They monitor everything what happens in front of the bus, behind it and on the side. What’s important, these vehicles meet the most stringent exhaust emission standards. Therefore, they are very environmentally friendly and contribute significantly to improvement of quality of life in our cities" – explains Krzysztof Musiał, Regional Sales Director in Solaris Bus & Coach. Modern buses also feature multimedia, advanced technologies and systems, facilitating location of the fleet and displaying of passenger information. "In the scope of passenger information systems, we have taken a giant leap forward in terms of quality. We remember the times when buses traveled with information on run and route number written on common boards. We started production of the first electronic information displays about 27 years ago. We have accessorized 108 brand new Mobilis buses, which now travel on the streets of Warsaw, with the latest solutions" – says Anetta Knitter, General Manager of Zakład Elektroniczny SiMS, which supplies dynamic passenger information systems. Until 1978, Warsaw public transport was based on the popular “cucumber” buses made by Jelcz that achieved a kind of cult status. Their successor and the longest operated vehicle in the capital was the symbolical Ikarus 280 bus, which was removed from service in 2013. A major increase in terms of routes and number of vehicles was reported in night bus service. Over twenty years, the length of night bus routes was increased more than 2.5 times, from 319.1 km in 1995 to 833.8 km in October 2015. The number of buses designated for operation of night service increased from 57 in 1995 to 99 in 2015. Today, we had an opportunity to travel by a new bus made by the Mobilis group, which started performance of a 7.5-year contract to operate public transport in the capital. Fifty articulated and fifty nine-meter long buses entered the streets of Warsaw. All of them meet the highest European emission standard Euro VI and will offer very comfortable travel to passengers. Within preparation to performance of new contracts, the company modernized and expanded its bus depot, which will allow for long-term maintenance of the fleet keeping all buses in good condition. The contract signed by ZTM with an independent operator assumes adding a hundred of modern buses and delivery of eight spare vehicles (four Solaris Alpino 8.9 LE and four Mercedes-Benz Conecto G buses), which will serve as substitute buses in case of unplanned events and scheduled maintenance repair. The vehicles will be assigned to different routes in the city, within the limits specified in the contract, i.e. about eight million vehicle-kilometers a year. “Within the contract, we offer not only modern buses. Equally important are the aspects related to their performance, meaning our employees. Our drivers and supervisors passed exams certifying their skills with no problem, technical workers had undergone proper training, and managers are well aware of requirements that have to be fulfilled. All personnel dedicated to service of these contracts are employed as full-time employees within employment contracts” – informs Dariusz Załuska, General Manager of Mobilis Group. Vehicles are also accessible to wheelchair users and passengers carrying children in strollers. “Engines in all Conecto G buses are built-in in such a way that they offer full lowering of the floor from the front entrance to the back. In addition, all vehicles meet the most stringent emission standard Euro VI, with emissions practically at the limit of detection” – says Antonio Cavotta, General Manager of EvoBus Polska. In addition, as standard, vehicles are accessorized with air conditioning, monitoring, ticket machines, LCD displays with passenger information, and stop announcement system. An important convenience is dynamic passenger information system. “All buses feature the most advanced dynamic passenger information systems and systems facilitating location of vehicles and efficient fleet management. In addition, the buses operated in the capital use also monitoring system made by SiMS, which along with our own software gives a lot of possibilities, including online preview for recordings, which in the surrounding reality report increasing use and play a major role in passenger safety” – says Anetta Knitter, General Manager of Zakład Elektroniczny SiMS. On February 24, EvoBus Polska signed a contract with Mobilis regarding purchase of 54 low-floor Mercedes Conecto G buses. The Polish dealer of Mercedes and Setra presented the best offer to Mobilis. Vehicles, which will be acquired by the company, will be sent to service in public transport of Warsaw. The new buses will debut in the capital in August and the entire service covered by the tender will be continued for the next seven and a half years. These are the terms of the tender, which was won by Mobilis last year in Warsaw. More information on this topic can be read here. It’s worth mentioning that these are first in four years Mercedes buses on the streets of the capital. In 2012, MZA purchased 60 Conecto G buses as well. “We congratulate Mobilis for winning the tender in Warsaw. We are proud that Mobilis chose Mercedes-Benz articulated buses and in the same time we can offer to Warsaw residents the highest standards of safety and comfort in public transport. Signing the contract, we continue successful cooperation between our companies.”- said Antonio Cavotta, General Manager of EvoBus Polska. “Operation of public transport in Warsaw is for us an important area, in which we want to improve and develop. Along with the start of performance of the latest contract, the Warsaw fleet of Mobilis will have more than 300 vehicles, which will strengthen our position as the biggest private operator of public transport in the capital. This time, tender requirements were very high. Thanks to cooperation with EvoBus Polska, we are certain that the highest quality and comfort of travel will be maintained. What’s more, all vehicles (including Mercedes) will be meeting the most stringent European emission standard Euro 6.”- that’s how the choice of Mobilis was argued by its General Manager, Dariusz Załuska. Mercedes Conecto G buses are equipped with full air conditioning of passenger space and driver’s cab. In addition, buses are provided with dynamic passenger information system along with announcements, also outside the bus, and monitoring system of bus interior. The entire passenger information system will be delivered by the Polish company Zakład Elektroniczny SiMS from Bydgoszcz. Vehicles will be provided with ticket machines. Buses will have a new standing engine Mercedes OM 470LA with 265 kW in power. The unit reaches maximum torque at 1700 Nm. Its engine cylinder capacity is 10.7 l. The engine can be distinguished by very advanced and heavy duty design. Other features include two camshafts mounted on top, Common Rail injection system, and high pressure injection up to 2100 bars. In terms of exhaust cleaning, the latest engines are based on BlueTec6 technology developed by Mercedes. It includes a closed particulate filter working in combination with the SCR system that has been operating successfully for many years and oxidation catalyst. In addition, the system is completed with cooled gas recirculation system. In particular, particulate and nitrogen oxide emissions are reduced to the level that is at the limit of detection. It is not only a clean-operating engine, but it also uses less fuel than its predecessor. It can be achieved thanks to electronically controlled two-stage air compressor and controlled auxiliary subassemblies with battery and generator control system. Along with transition to Euro VI, reduction in fuel usage has been accompanied by decreasing consumption of AdBlue and engine oil. Another feature is long service intervals and long life of subassemblies. Drivers can take advantage of good acceleration thanks to high torque, achieved even at speeds below 1000/min, and high performance engines. Passengers appreciate first of all quiet operation of propulsion systems. It can be accomplished not only by engine design, but also new insulation made from “sandwich” panels mounted on the side of passenger compartment. It consists of two exterior metal sheets and insulation layer placed between them. From the side of passenger compartment, insulation material is covered additionally by plastic coating. Conecto G Euro VI bus has distinct back features that make it easy to recognize; its coolant expansion tank is placed on top behind a special cover on the roof. It gives the vehicle a dynamic look. There are also newly designed engine cover and service flaps on the left side. Engines in all Conecto G buses have vertical tower design, standing from the left side in the back of vehicle. It provides not only possibility of full lowering of the floor from the front entrance to the back, but also easy operation through comfortable access to subassemblies from outside the bus. Only one manufacturer of passenger information systems appeared at the Warsaw Bus Expo in March. This company was SIMS of Bydgoszcz. During the exhibition in Nadarzyn, the company boasted its achievements to date and several new items in its offer. SIMS presented in a comprehensive way on its stand its biggest project in the scope of implementation of dynamic passenger information systems. It was obviously Wrocław. Within this order, SIMS activated more than 600 information displays on stops and mobile vehicle monitoring system. The company is also proud of its new large order, which it received from Mobilis. Within this contract, SIMS will provide high-resolution displays, LCD displays and GPS system to more than a hundred buses, which since August will start appearing on Warsaw streets. We are informed about the details by Mateusz Gurtowski, SIMS Sales Manager. Mobilis officially informed what company will supply articulated buses for implementation of the ten-year contract in Cracow. This company is Mercedes-Benz, which until August of this year will deliver to the carrier 37 Conecto G buses with Euro 6 engines. Let’s remind that Mobilis has already ordered 26 vehicles in MIDI and MAXI versions. They will be delivered by AMZ Kutno (5 units of CitySmile 10 LF and 21 units of CitySmile 12 LF), which will be operating Cracow routes jointly with Mercedes buses. Who could have predicted such liaison two years ago … ? “We are happy that we meet all technical requirements of the City of Cracow in terms of passenger service and that Mobilis choosing us as its partner decided to select Mercedes-Benz buses and our service. We are very grateful for this trust – said Antonio Cavotta, General Manager of EvoBus Polska. – It also means great responsibility and we will do everything to support Mobilis in an optimum way during this route operation. Starting from August, Conecto G Euro 6 buses will travel on the streets of Cracow – very environmentally friendly busses with emission at a limit of detection.” Cracow’s Conecto buses will be equipped with full air conditioning of passenger space and driver’s cab. In addition, buses will be accessorized with dynamic passenger information system along with announcements (also outside the bus). Vehicle safety will be improved by monitoring system of bus interior. The entire passenger information system will be delivered by the Polish company Zakład Elektroniczny SiMS from Bydgoszcz. You are cordially invited to read the article that was published today in the daily Gazeta Prawna. Those who commute daily using public transport are well aware of the fact how important is information on performance of public transportation service. Zakład Elektroniczny SiMS is one of the leaders in production of dynamic passenger information systems, mobile monitoring and vehicle diagnostics. The strength of company is based primarily on innovation, taking on new challenges and an extensive offer of high quality products. Stop displays, information displays mounted in vehicles, onboard computers, video recorders and cameras – are only some of them. – We help to travel – that’s a brief response on the key activity of the company given by the General Manager of Zakład Elektroniczny SiMS. - How? By delivery of full information presented on electronic media of passengers. It includes, among others, route number, departure time and stop name. It makes travel by public transport comfortable, pleasant and safe – he continues. - Systems are constantly upgraded and improved by our design team in order to meet expectations of our customers. Hard work focused on highest quality led to the IRIS certification (International Railway Industry Standard). It is one of the most prominent standards in the transport industry, recognized worldwide. With such tool we are always two steps ahead. Another equally important event in activity of our company was performance of a project abroad. This year, our focus is on implementation of two new systems in the cities of Cracow and Wrocław. In Cracow, approx. 70 vehicles will be comprehensively accessorized with monitoring systems inside and outside, information displays, ticket punches and ticket machines integrated with the Cracow City Pass. Currently, works are underway on installation in vehicles; since August 1, the newly accessorized vehicles will travel in the old capital of Poland. SiMS puts special emphasis on relations with customers; therefore, presence on trade fairs and meetings with contracting parties constitute an important part of our work, which allows to determine their specific expectations. During this year’s International Security Fair SECUREX, our mobile network recorder eS-NVR-2000, a professional product, was very popular among visitors. These devices are used primarily in public transport vehicles. Their greatest strengths include reliability, functionality and a broad range of video recording. Our strategic goals for the coming years include design, production and delivery of innovative solutions developed according to the highest standards. Hopefully we can keep it up !